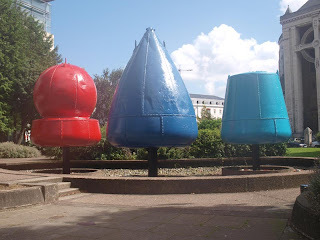 Alan in Belfast: £3,000 to repaint three buoys - one of them the wrong colour? 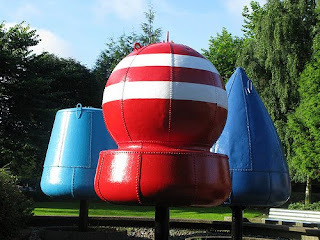 £3,000 to repaint three buoys - one of them the wrong colour? Over the past few years, Belfast’s Cathedral Quarter has really opened up. With arts festivals, events in the Black Box, and a great bagel shop, I’ve had more and more reasons to wander past St Anne’s Cathedral and the Art College (UU Belfast campus). Recently something changed. Just before the Tall Ships Festival, the buoys were repainted. Belfast City Council’s Parks and Leisure Department – who are responsible for the garden – had noticed the “poor condition of the buoys” and decided it was time to make them ship shape. Obviously, public art needs to be maintained. And without a fresh lick of paint, the buoys would peel and rust and eventually deteriorate beyond recognition. Over a week, and for an estimated cost of £3,000-£3,500, the Council’s Property Maintenance Section repainted the three buoys. Seems an awful lot of money and time to spend on three buoys. Not sure I could afford those guys to come and repaint my house! Despite going to a lot of cost and effort, it’s rather strange to discover that the flat-topped buoy (previously red) was painted a pale blue colour – not even the same blue as the blue pointy buoy beside it. The Council department don’t have any explanation for the change. Perhaps they were using up spare tins of paint in the shed? But the two shades of blue are ghastly. As I walked past the garden, if I’d taken a closer look I might have noticed the plaque that explains how they came to be there. The maritime influence is strong in Ulster. The coastline is long and there are many harbours. Belfast has a tradition as a sea port and shipbuilding city. Ulstermen over the years have built fine ships and served at sea in wartime and in peace. They have fished for their livelihood and sailed for pleasure. Belfast City Council has used the gift of three navigation buoys from the Commissioner of Irish Lights as the theme of an Environmental Improvement Scheme to mark the Ulster seagoing tradition. These three buoys are more than 50 years old and are in pre 1979 Lateral System Buoyage colours. They are of the type used in local waters. In a way, it’s a memorial garden, keeping alive the local maritime heritage which is diminishing with each passing year. I don’t notice a lot of art galleries or museum curators changing the colour of art works at a whim. So as a piece of public art and as a memorial to our maritime past it feels like, after a period of neglect, Belfast City Council have committed an act of gratuitous vandalism. Update Wed 23 - Good Morning Ulster followed up the buoy story - none of the buoys should ever have been painted blue - another repaint on the horizon. Did councillors even bother to read. learn and inwardly digest the notice which states that "These three buoys are more than 50 years old and are in pre 1979 Lateral System Buoyage colours" ? Most of them are akin to Philistines! I expect the head honcho of whatever department was concerned simply told the foremen to use trendy, contemporary colour schemes. Who knows? It wouldn't have gone near the councillors. It would be Parks & Leisure department just doing their job. But "there is no paper/e-mail trail concerning any decision to change the colour scheme" ... "the colours were selected by the Property Maintenance Section" who did the repainting work. I've heard the buoys are actually depth charges. some say they haven't even been deactivated yet and may go boom at any time. hopefully when a load of (insert group you most like to hate here) are standing nearby. The 'spare paint pots' comment might be close to the mark. The colours used are the same as those used by the department are their vehicles. 3K for one man days work? I'm changing jobs. Also did there not used to be water in the display? way back when? I went to the Art College and hated the site of those damn buoys. I’m sure I have a photo somewhere of them but it would be at least 6 or 7 years old and *gasp* on photo paper rather than digital so goodness knows where it is now! I hoped once the renovation was underway they would be removed or at least made to ‘fit’ in with the surroundings. That area in front of the college looked awful before the renovation and now looks 10 times worse. I understand the heritage side of the debate and do not wish for them to be destroyed but perhaps moved to the docks area where they would be more in keeping with their surroundings. I will add that my bus passes there every morning and the wife (who works across the road from them) and I both commented on how long they were taking to paint them. It seemed to us that 2 men were taking over a day just to paint half of one buoy, no wonder it cost so much. Goodness knows how much extra it would have cost to add the white stripes to the red one (the only design I actually liked) The clashing blues do look ridiculous and I imagine it is most definitely a case of what paint they had leftover rather than a deliberate style choice. Killian is right. the buoys originally sat on pillars of water from fountains beneath them. That made visual sense and linked them to their maritime heritage. But the fountains haven't been turned on for many years, and I presume are now silted up with Buckfast bottles and assorted debris from park users. Without the fountains, they are just fairly ugly things on sticks. Every time I see those Buoys I am reminded of that old New Order video.